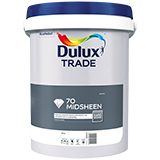 Dulux Trade 70 Midsheen is a finishing paint for interior and exterior use. All purpose wall and ceiling finish for application to interior and exterior cement plaster, fibre cement, concrete, brickwork and various types of composition boarding. Also suitable for application to metal and wooden surfaces, provided those surfaces are suitably primed before the application of this material. An economical washable coating with low dirt pick-up.